Turns out I was wrong about something. But I’ll get to that and correct the record later in this report. For those of you who checked your email and Twitter early enough this morning, hopefully you got my message and tuned into Alan Stock’s interview of Speaker-of-the-Weak John Hambrick on KDWN 720 AM. It was unbelievable. Right off the bat, Stock asked Hambrick about the kerfuffle between him and conservative Assembly Majority Leader Michele Fiore – and yes, after listening to the interview, I’m convinced that Fiore is still the Majority Leader. But we’ll get to that later, too. I know that Hambrick’s statement isn’t true because before the December 2 caucus meeting I spoke directly with him and asked if he wanted the position. He said absolutely yes. And I do recognize that that’s my word against his. And this is where I was wrong and need to correct the record. Going into the December 2 caucus meeting, my understanding was that moderate Assemblyman Paul Anderson had 12 votes for Speaker-designee and conservative Assemblyman John Ellison had 12 votes, with then-Speaker-designee Ira Hansen being the tie-breaking vote. But the day before, Hambrick suddenly announced that he was running for Speaker, as well. Believe me, nobody on our side asked him to run. The conservatives were united behind Ellison up to this point. I also understood that at a meeting of the conservative bloc prior to the caucus meeting, the two Johns – Ellison and Hambrick – left the room to “work it out” as to who would be the Speaker-designate representing the conservatives, and that Mr. Ellison graciously decided to step aside. Turns out, that’s not exactly what happened. That’s the part I got wrong. What learned this morning after Hambrick’s claim on the radio is that Hambrick had actually gone to a meeting of the moderate bloc prior to the meeting with the conservative bloc and promised his vote to Anderson. And that’s why Anderson was reportedly so shocked and angry when he was informed that Hambrick had the 13 votes to be Speaker instead of Anderson. It appears Hambrick double-crossed Anderson! Indeed, multiple people who were in attendance at the conservative bloc meeting have now confirmed to me that Hambrick went into that meeting and issued an ultimatum: Either you make me the Speaker-designee instead of Ellison, or I’m voting for Anderson. So the conservatives had no choice. It was either vote for Hambrick and roll the dice that he’d be supportive of them…or Anderson, who everyone knew was a tool for the governor’s agenda, including the coming billion dollar tax hike. So Hambrick’s statement that he “never asked for this job” is only accurate in the sense that he didn’t “ask” for it; he demanded it! It also now appears that Hambrick is trying to make up to Anderson for double-crossing him by booting Fiore out of the Majority Leader’s position and installing Anderson in an effort to keep Anderson from using the “nuclear option” to oust Hambrick on opening day of the Legislature on February 2nd. WOULD YOU LIKE SOME WAFFLES WITH YOUR TAX PLEDGE? Stock went on to challenge Hambrick’s claim that he removed Majority Leader Fiore from the Taxation Committee because of the controversy surrounding some tax liens that have been filed against two of her businesses. 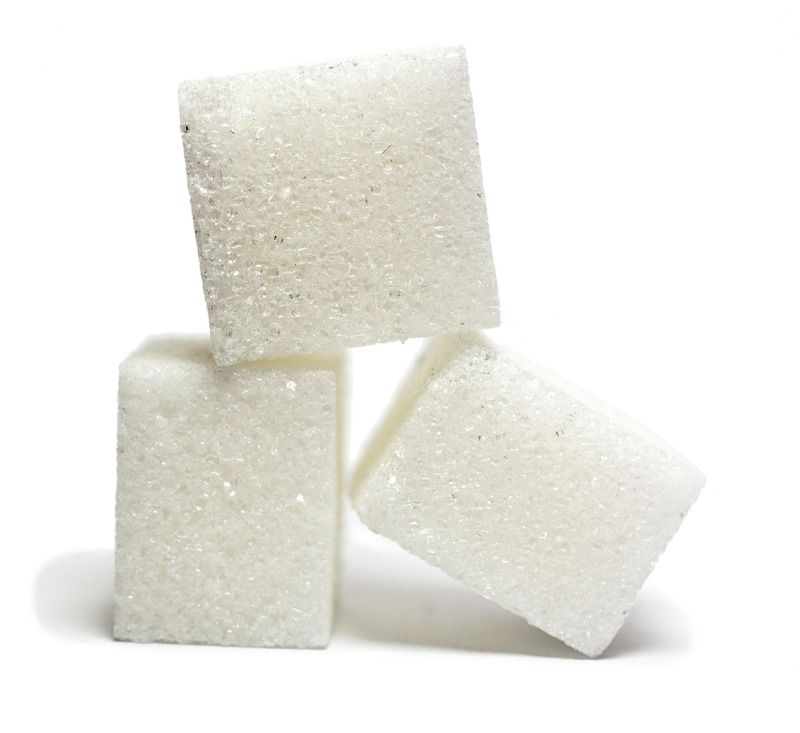 He asked why over the weekend Hambrick dumped two Tax Pledge signers – Assemblywoman Victoria Seaman and Assemblyman Brent Jones – from the Taxation Committee since they had nothing whatsoever to do with any of the controversies surrounding Fiore. Instead, Hambrick said that he was a signer of the Tax Pledge himself while neglecting to mention that he said in a TV interview two weeks ago that he intended to break his Tax Pledge and suffer the consequences in order to support the governor’s tax hikes and higher spending on public education. So is he going to honor his Tax Pledge or isn’t he? Only his hairdresser knows for sure! Hambrick then was asked about replacing Fiore as Taxation chair with freshman Assemblyman Derek Armstrong, who has not signed the Tax Pledge and has absolutely no legislative experience whatsoever. Hambrick said the Tax Pledge “was not a litmus test for me” and then declared that the new vice-chair of the Taxation Committee, Assemblyman Randy “Kirner Tax” Kirner (RINO-Kirner Tax) had plenty of experience and would be there to help the rookie out. Which leads to the obvious question: Why not just make Kirner the chairman and appoint Armstrong as vice-chair? Getting it backwards sounds like really, really, really bad judgment to me. Spoken like a true Tower of Jello. Men, do me a favor. Ask your wife if it’s OK for you to honor your marriage vows “by and large” and let me know how that turns out for you. I swear, I’ll bet Hambrick has trouble in the morning making a decision on whether to wear his black socks or his black socks…and switches back and forth seven times before putting his shoes on! Hambrick said he was seeking legal opinions on whether or not he had the power to do what he did. Which, of course, raises the question as to why he didn’t get such a legal opinion BEFORE he made his announcement? In fact, inquiries have been made to the Legislative Counsel Bureau, which oversees legislative affairs, and I’m told that LCB’s position is that there is no law granting Hambrick such authority; that it’s an issue to be resolved internally based on caucus rules. Which Hambrick admitted on-air he didn’t know and hadn’t read before announcing his decision. The bottom line is this: Since Hambrick can’t produce any back-up giving him the authority to unilaterally overrule an election by caucus members, Fiore remains the duly-elected Majority Leader unless or until such time as the caucus MEMBERS, not Hambrick, collectively un-elect her. I first heard about this last week but couldn’t confirm it. However, in today’s interview Hambrick himself revealed that he removed Majority Leader Fiore because he was being blackmailed…maybe, if not probably, by his own political consultant! First Hambrick attempted to duck questions from Stock by claiming that Majority Leader Fiore had threatened to sue him over her removal as Chair of the Taxation Committee. As such, Hambrick claimed he couldn’t be forthcoming in his answers out of fear of legal ramifications. So I immediately called Fiore and asked if it was true that she had threatened, or was even considering such a lawsuit. She told me, in no uncertain terms, that she absolutely, positively never even remotely suggested that she was considering any such thing, nor had she ever even thought about it. So yet another bald-faced whopper by Hambrick. Looks like the man is gonna be spending a lot of time in the confessional booth on Christmas Eve. Hambrick disclosed that as a result of some accusations that Fiore made last week relating to a pair of political consultants – Cory Christensen and Nathan Emens – that one of them was threatening to sue Fiore for allegedly damaging his reputation and harming his ability to get business in the future. But what I heard as a rumor last week relating to that threat was confirmed by Hambrick today. Why didn’t Hambrick immediately call the police and report the blackmail threat? Which of the two consultants blackmailed him? I’m guessing the answer to the second question will answer the first. Christensen was hired as a political consultant to the Republican Assembly Caucus last year. He’s Anderson’s guy. And he was already out of the picture before Fiore’s comments. In fact, he was fired by a majority vote of the caucus members shortly after the elections were over thanks, at least in part, to his support in GOP primaries of moderate GOP candidates against conservative GOP candidates who ended up winning in the general anyway. So nothing Fiore said about Christensen was either slanderous or untue. As such, it’s highly unlikely that he’s the one who blackmailed Hambrick. If I’m wrong, then all Hambrick has to do is say it was, in fact, Christensen and not Emens who blackmailed him and I will stand corrected. First, Emens is Hambrick’s guy. He’s been Hambrick’s political consultant from the beginning and it’s far more likely that Emens and Hambrick would have talked about Fiore’s accusations than Hambrick and Christensen. And the very next day Hambrick ousted Fiore as chairman of the Taxation Committee. Yeah, right. If you believe that I have a Tax Pledge signed by Sen. Moderate Mike Roberson I want to sell you! Whether Emens is the blackmailer or not, there’s still another problem with him. Emens got paid a lot of money this last election cycle working for the Republican Assembly Caucus and continues to be Hambrick’s consigliore. So if it was discovered that Emens was simultaneously working for the other team – meaning the Democrats, not the moderate Republicans – that would be a HUGE problem, right? And although there’s some dispute as to whether or not Fiore used the term “criminal conspiracy” when referring to Emens in her interview – and I’m trying to get a transcript to confirm – what Fiore tells me she was referring to was whether or not it was just an ethical breach to work for both sides or, as in the case of realtors and attorneys and such, a criminal act to work for opposing players at the same time. I guess it all depends on your definition of “skilled,” but I digress. Also, Nathan’s claim that he “is the ONLY consultant to successfully flip a seat in the Nevada Assembly from Democrat to Republican in more than a decade” is demonstrably not true. By my count, there were around 10 seats in the Assembly that went from D to R this year, and Nathan had nothing to do with any of them. But again, I digress. Believe me, that’s an important part of this story, so keep it in mind for later on. He also received $14,494.77 from Assemblyman James Ohrenshall. Who happens to be a…DEMOCRAT. So while all those Republican organizations and grassroots activists were busting their humps to elect more Republicans to the Assembly, Emens pocketed almost $15K for a member of the opposing team. 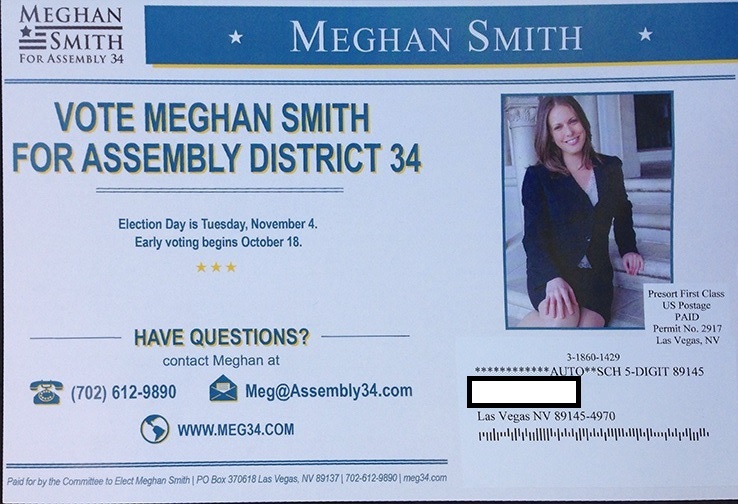 In reviewing the campaign finance reports of the Democrat candidate for Assembly District 34 this year, Meghan Smith, it’s interesting to see they do NOT include Campaign Data Solutions, Emens’ company. Indeed, there are thousands of dollars included on her campaign finance report for “USPS” – the United States Postal Service. But no mention of Nathan Emens or Campaign Data Solutions. 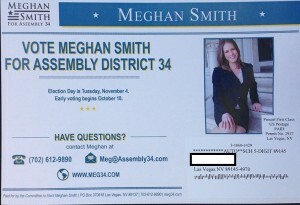 Imprinted on a mailer for a Democrat Assembly candidate running against a Republican Assembly candidate? I can’t WAIT to hear Li’l Nate’s explanation for THIS! Now let me be clear. I haven’t personally verified if this permit number does, in fact, belong to Campaign Data Solutions. It was confirmed to me by two individuals who are both reliable and trustworthy. But if a mistake has been made and this is not Nathan’s permit number, I will be happy to correct the record and offer a sincere apology. But in following the example that has now been set for Majority Leader Fiore and her tax liens, let’s just assume he’s guilty until he proves he’s innocent. And since this is what Fiore was referring to as it relates to unethical, and possibly criminal acts (though I sincerely doubt that there’s a law in Nevada criminalizing unethical behavior by political consultants! ), Emens’ alleged lawsuit threat and possible blackmail simply have no substance. As if we didn’t already know this before today’s disastrous interview, but John Hambrick doesn’t have what it takes to be Speaker. He’s indecisive. He’s untrustworthy. He’s uninformed. His word is now meaningless. And he possesses all the political acumen of Mark SureWould and the Geico gecko. I’ll wait until after Christmas Day to see if he does the right thing and steps down. Plans for a recall are already in motion. So sit tight and stay tuned.